Pei Wei is testing a number of Asian fusion tacos out in San Diego, CA and Miami, FL, including new Korean BBQ Tacos. Rather than a traditional corn or flour tortilla, the new tacos use what they're calling a "roti bread" tortilla. Roti is a flatbread that originates from South Asian cuisine. You might consider it the flatter cousin of naan. 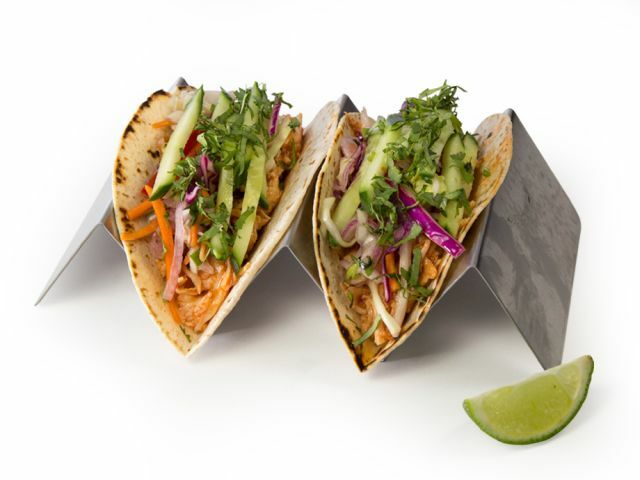 The Korean BBQ Tacos feature a filling of pulled chicken stir-fried with bulgogi sauce (a sweet and in this case, spicy, soy-based sauce), cucumbers, cilantro, and Asian slaw. Also being trialed are new Sweet Chili Shrimp Tacos and Teriyaki Steak Tacos. The Sweet Chili Shrimp Tacos come filled with crispy shrimp, cucumbers, cilantro, Asian slaw sweet chile sauce, wasabi aioli, and fresh Fresno peppers, while the Teriyaki Steak Tacos include wok-seared steak, cucumbers, cilantro, Asian slaw, Sriracha aioli, and fresh Fresno peppers. The new tacos are sold in orders of two for $5.99. Each order also come with a lime wedge.